Dr. Sohail Inyatullah, a political scientist, is Professor at Tamkang University,Taipei (Graduate Institute of Futures Studies), Visiting Academic/Research Associate at Queensland University of Technology (Centre for Social Change Research); Adjunct Professor at the University of the Sunshine Coast (Faculty of Social Sciences and the Arts); and, Associate, Transcend Peace University. 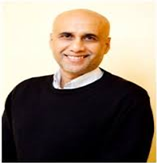 Inayatullah is a Fellow of the World Futures Studies Federation and the World Academy of Art and Science. He is on the International Advisory Council of the World Future Society, and on the Professional Board of the Futures Foundation, Sydney. In 1999, he held the UNESCO Chair at the Centre for European Studies, University of Trier, Trier, Germany and the Tamkang Chair in Futures Studies at Tamkang University, Taipei, Taiwan. From 1981 to 1991, he was senior policy analyst and planner with the Hawaii Judiciary, where he coordinated the Court’s Foresight Program. Inyatullah is most famous for introducing and pioneering the futures technique of causal layered analysis, that uses a four-layered approach to bring about transformative change. He introduced the idea in a widely cited paper for Futures. He also edited and wrote the introductory chapter for the Causal Layered Analysis (CLA) Reader.